I have collected bluegrass memorabilia for years. 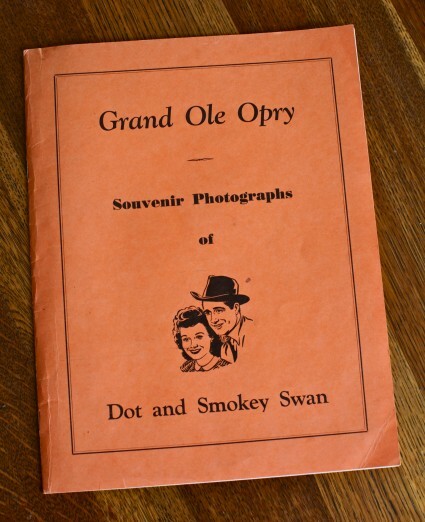 One of the treasures I happened upon is an old Grand Old Opry program from the mid 1950’s. It’s a program that showcases an obscure husband and wife team named Dot and Smokey Swan. I found this clip in a trade magazine from 1955. I’m not sure Dot and Smokey ever got very famous, but they did play the Opry with Bill Monroe. That alone is cool enough for me. 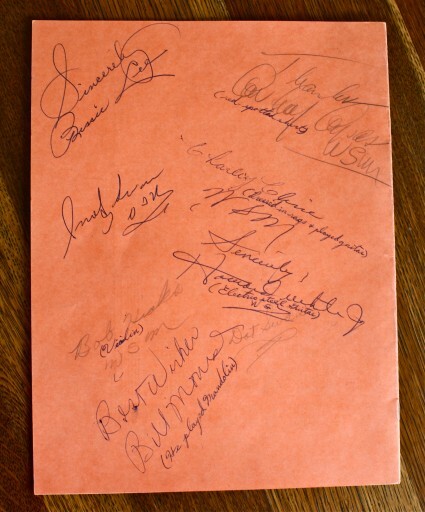 Luckily the new owner of the program got most of Monroe’s band to sign it that day. 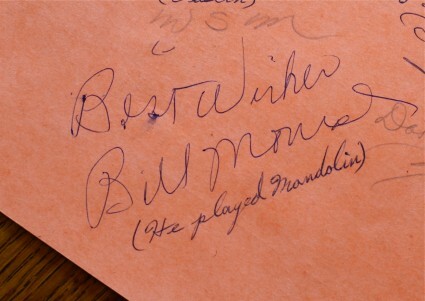 The person who saw them at the Opry must have been a fan of Dot and Smokey’s, because when the signatures were collected, they wrote underneath Bill Monroe’s name, “(He played mandolin)”. Any self respecting bluegrass fan knows that! 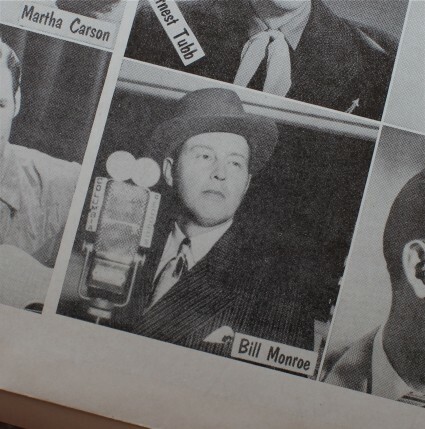 Here’s a proud picture of Bill from inside the program. Bill Monroe had a hard time keeping musicians in his in band for very long. During this period, Bill had some incredible musicians with him. 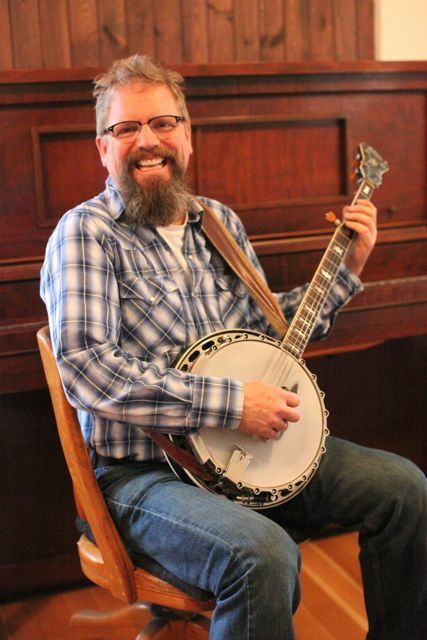 Charlie Cline played fiddle banjo, guitar and probably bass. Bobby Hicks mainly played fiddle but also played banjo as well as bass. 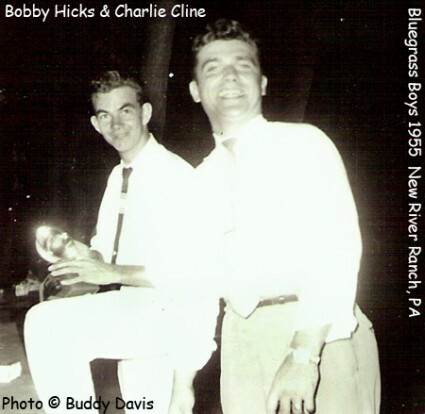 Here’s a great interview with Bobby about the early days with Bill Monroe. 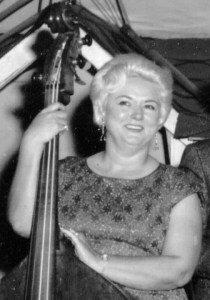 Bill’s long time lover, Bessie Lee Mauldin, played bass with him at that time. A movie about Bessie Lee’s and Bill’s relationship is in the works. Here’s a little bit about the movie by Bill Graham that I copied from the wonderful Mandolin Cafe website. Feb. 11 2011 – The Hollywood movie about Bill Monroe’s life and times, Blue Moon of Kentucky, now has some soundtrack cuts in the can. Jolly said former Monroe protege, Del McCoury, will sing the Monroe songs on the soundtrack. Actor Peter Sarsgaard is set to play Monroe. 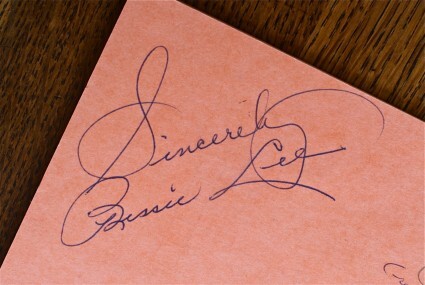 His wife, actress Maggie Gyllenhaal, has told reporters that she will play Bessie Lee Mauldin, Monroe’s lover who often toured with the Blue Grass Boys and played bass on stage and in recordings. Jolly said negotiations are underway with a number of entities regarding production of the film. It’s hard for me to imagine a movie tackling a subject as immense to so many as Monroe stands. But sometimes it works, or at least draws more people to our music and the mandolin. Judging by the names involved with the music, Blue Moon of Kentucky is at least off to a good start. 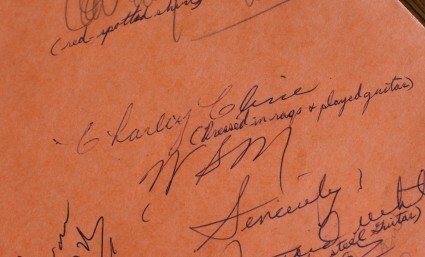 Here’s a video featuring Bill Monroe, Bobby Hicks on fiddle as well as Charlie Cline on fiddle from the same period this program was signed. 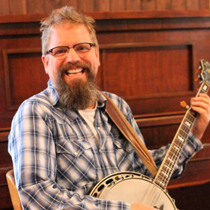 What is most interesting in this video is the banjo player, Jackie Phelps. He is only playing with his thumb and index finger on his right hand, the picking hand. 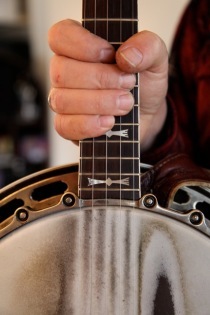 Almost all banjo players use the thumb and 2 fingers, a style popularized by Earl Scruggs. How he plays 2 finger style at this speed is beyond me. Here’s another video from the same show that feature a rare performance of Bobby Hicks playing some fine banjo. I had no idea he played banjo until I saw this. Bobby played fiddle for nearly 25 years with Ricky Skaggs. Jackie Phelps has switched from banjo to guitar for this song. Man oh man, those guys were versatile and good! One more video of these great musicians. This time Charlie Cline is playing banjo. Red Taylor and Gordon Terry have joined Bobby Hicks for a triple fiddle cage match! 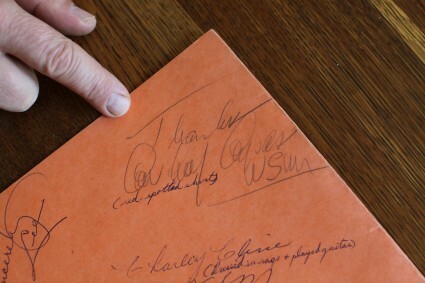 One of the other interesting signatures on this program is Cowboy Copas. He was an Opry star during this period. His story is very interesting as he died in a plane crash on March 5, 1963 along with Opry stars Hawkshaw Hawkins and Patsy Cline. The pilot was Copas’ son-in-law (and Cline’s manager), Randy Hughes. 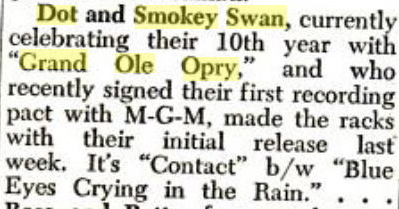 Dot and Smokey Swan recorded Blue Eyes Cryin’ In The Rain and Crazy. I am looking for a recording of this…Blue Eyes Cryin’ In The Rain was the A side and Crazy was the B side. 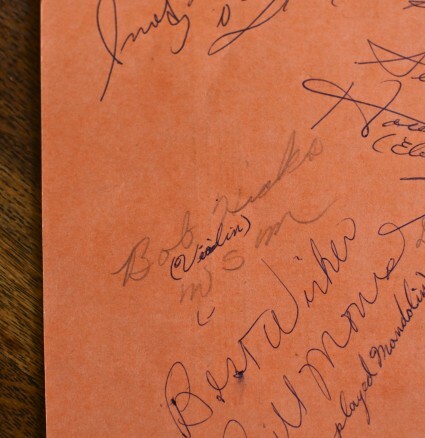 The reason I am looking for this is Dottie Snow – Tubb had asked me to find this for her as she is related to Dot. Any help would be appreciated as she has been looking for this for a long time. 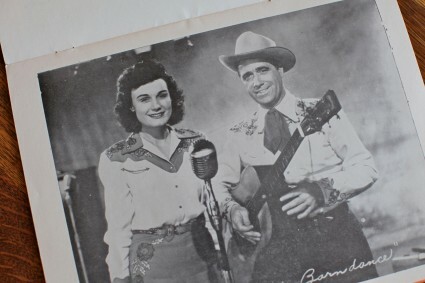 Dottie Snow married Hank Snow’s son and is now married to Glenn Douglas Tubb, legendary songwriter…Skip A Rope.. Glenn is the nephew of Ernest Tubb. Thanks for anything you can do to help Dottie out.